SEAT enjoyed a 32 per cent boost to fleet sales in the opening three months of 2017, compared to the same period a year earlier, making it the fastest growing brand in UK fleet sales. An 86 per cent rise in true fleet sales led SEAT’s overall fleet growth and countered a 45 per cent drop in rental volume. Additionally, Motability volume was up by 440 per cent in quarter one of 2017. The Spanish-based VW Group-owned brand has made itself an increasingly attractive name amongst fleet buyers in recent years, thanks in part to the recent introduction of the Ateca SUV (pictured), which competes with the mega-selling Nissan Qashqai and Kia Sportage. The Ateca’s success has also helped bring attention to the fleet-friendly credentials of the Golf-based Leon, Ibiza supermini, Alhambra MPV and Mii city car. 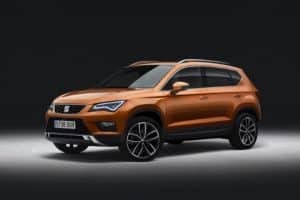 Peter McDonald, SEAT UK’s head of fleet and business sales, commented: “Ateca is a fantastic product in the most important growth segment in the market, but more significantly, it has broadened our brand product portfolio. That said, SEAT has gone the extra mile when trying to win over fleet customers. In the past year, the brand has introduced new initiatives like the four-day test drive programme, which improves the accessibility of demonstrator vehicles to businesses, and the Fleet Excellence scheme, which strengthens investment at the dealer level. “Following record quarter one registrations and an even better order take, the future looks bright and will strengthen further as the brand continues its product offensive,” added Mr McDonald. The rest of 2017 will see SEAT launch the all-new Ibiza and Juke-sized Arona before the end of the year.